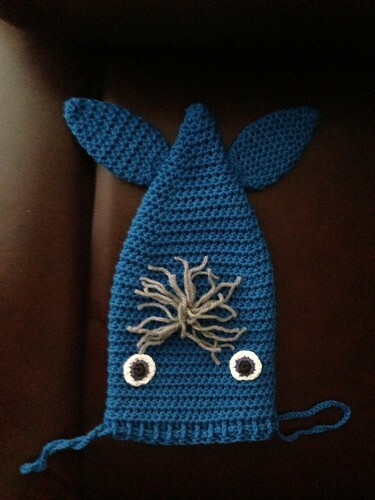 A few weeks ago I finished the largest crochet project I’ve ever done, the Drawstring Whale Bag. Mine looks a little different because mine was made with DCs instead of HDCs by mistake. I found the pattern when it was posted to Reddit. Besides getting a ton of practice in DCs, this was also the first time I did FPTCs and also the first time I changed yarn colors mid-piece (for the eyes). I’m not sure what I’ll do next. I’ve been thinking of doing another PacMan ghost, slowly working my way towards a set of four. The first piece of Crochet I ever did was a Brainslug, and later I made one of the mini-brainslugs for a friend. I loved the way the mini-brainslug turned out, and kinda wish I still had him. I might make another mini-slug so I can have my one (possibly to put on my PacMan ghost that I already made). This entry was posted in Uncategorized by Michael Cook. Bookmark the permalink.